As apart of the full API I have made available, there are now various RSS feeds across the site. From photos, to projects and of course blog entries. A full list of feeds are detailed in the API docs. As you can see they are all available in JSON format as well. In other news, I have managed to retrieve every blog post (except for one image) and the blog is back in full - well, except for the tags and comments. I have just downloaded this iPhone application and am very excited! You can set up services to send push notifications to the phone or even use their API to create a new instance of sending a notification. There is a chrome extension I have just installed as well which allows with a touch of a button, to send the page to the phone! The Apple website has been replaced with a very exciting advert. What do you think? 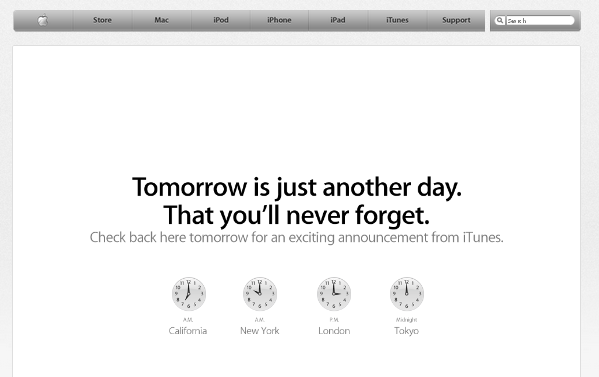 Will they be revealing a beautiful new look iTunes, an online music streaming service or the demise of Ping? I have never got this far in my university career before! Day three of my second year at the University of Leeds, very exciting. I moved up a couple of weeks ago and have been enjoying getting to know my new flatmates. The work however, has begun. For the Mobile Applications Project, we are learning the basics of Objective-C and making an iOS application (for iPhone, iPod Touch or iPad). YEY! We have 10 weeks to familiarise with the syntax of object orientated programming and the APIs and structure of iOS applications before finally demonstrating our application in the last week before Christmas. 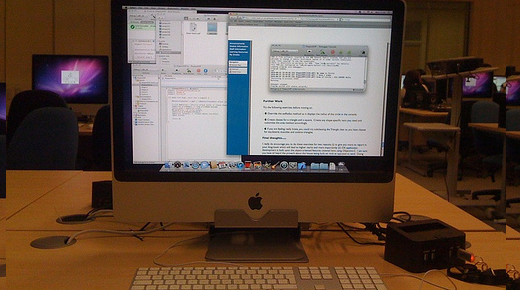 We'll be working in the school's Apple Mac suite as the SDK can only run on Mac OS X. As part of our assessment, we have to keep a blog-book (pun on log-book) and publish a tutorial on how to make our final application. I will add it here, on my blog (as well as the VLE), using the Mobile Application Project tag. More than 500 medical students at the University of Leeds are being issued with iPhones which can access online text books. The IT person behind this project will be coming in to speak to us about specific medical applications that they would like developing. I may be interested to take up one of their ideas or perhaps do something music based. I am undecided as yet but look forward to playing around with the different APIs the iOS has to offer.